Folks in Michigan, much like folks in other states I’m guessing – tend to really love it here. Pure Michigan. Mitten shaped necklaces. Cutting boards shaped like the state (with or without the upper peninsula). And maybe it’s because I wasn’t born and bred here, maybe because moving here as a teen took me away from some crucial developmental period where people learn to love this state but… well… I just… don’t. In the winter it’s too cold, in the summer it’s too hot. The snow is too snowy. The drivers are too left lane-y. It’s humid. The roads are full of potholes and are brutal on my car’s alignment. The list goes on. It may be home, but for the most part, it ain’t where my heart is. When I was younger, my grandparents had a cottage near Traverse City – but I didn’t spend much time there. My brother and I would visit occasionally during the summers when we were younger – shows at Interlochen, miniature golf, to Pizza Hut with my grandmother, and stopping at local stands on the side of the road to buy real maple syrup. Splashing in the lake, watching chipmunks… It was a visit with grandma. Traverse City was a different place for me when I went up north for the first time after my grandmother passed away. We gathered for her memorial celebration and I realized after my days there that for the first time in a long while, I felt an absence of stress. The heaviness that rests on my shoulders wasn’t there. Again, a few years later, joining some friends at the edge of the water on the bay. Talking well into dark as the water lapped around our beach chairs. That peace. And so now, I am overjoyed that we find reason to get up north far more frequently that I ever have in my life. There’s a connection I feel with this town that I have not felt anywhere else in Michigan. When I’m here, I think, Perhaps I can see myself staying in Michigan. And it’s not just the perfect blue sky or the water. If I’m being honest, I’m not entirely sure what it is about Traverse City that makes me love it so much. 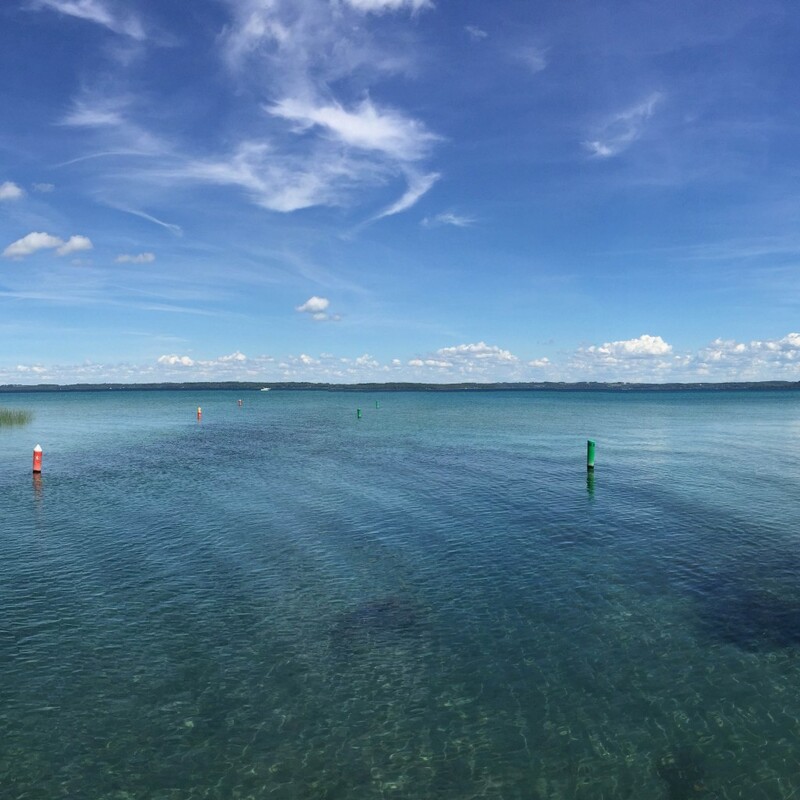 I could happily just ride along the coast of Traverse City all day – from one peninsula to another – but fortunately? I don’t have to. There are plenty of wineries to stop by along the way. L. Mawby. Sparkling wines. I love everything about Mawby – from their yummy bubbly to the cherry jalapeño cream cheese and crackers they serve with it. I tried something a little different this time – a wine called Redd. Redd, as you might imagine had more properties of a red wine – and given my tendency towards headaches after red wine, I tend to skip it. Fortunately, Chris traded me – his Leland for my Redd. Lovely, well made and fun. And from there we ventured over to Old Mission Peninsula. 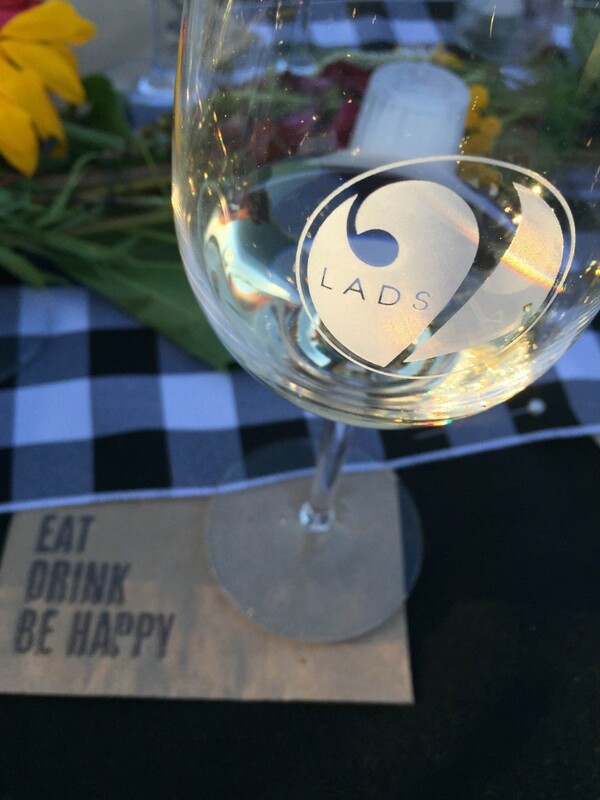 We ended the day at 2 Lads – our fave winery. 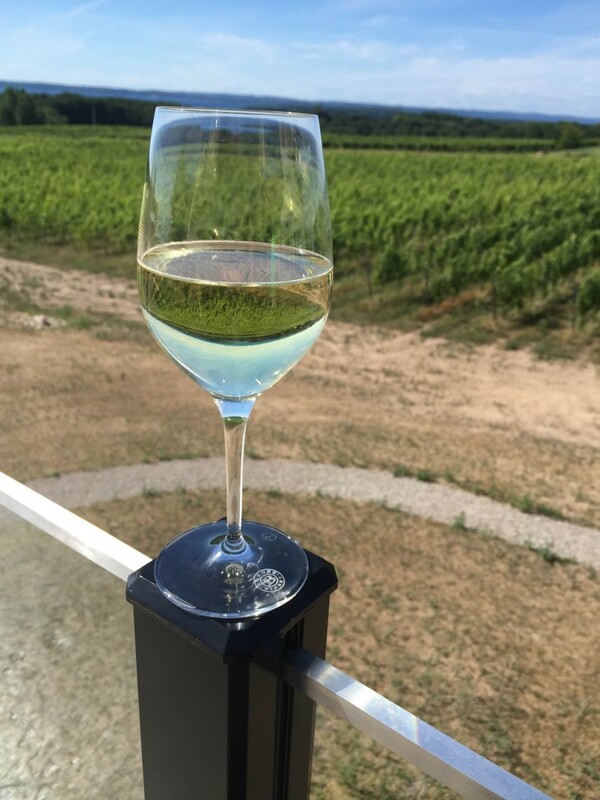 We recently joined their wine club – their rose’ is a favorite of ours (It’s also sold out which is a tremendous bummer because it is so good, so smooth and perfect for pairing with darn near anything when the weather is ten thousand degrees like it’s been). Saturday night we ate phenomenal food (are you seeing a theme here? 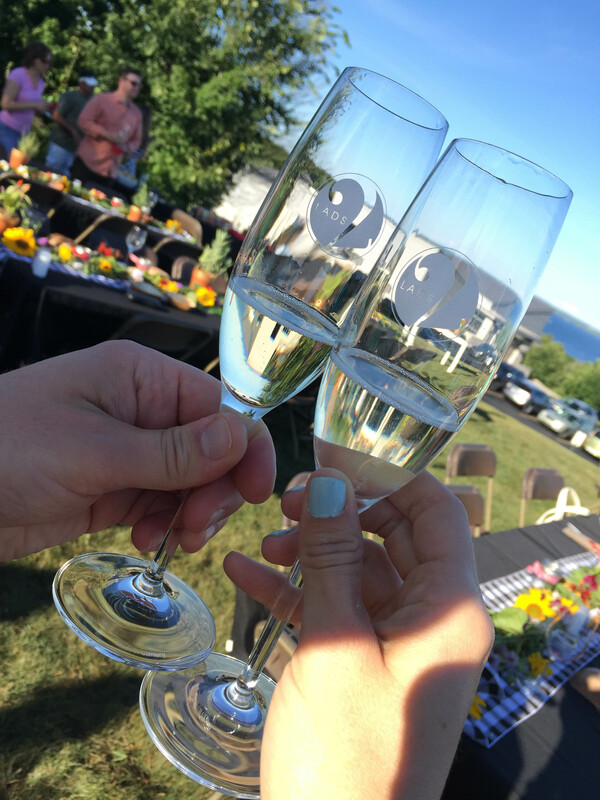 ), drank spectacular wine (ditto) and shared in the company of each other as well as the company of others who’d also traveled from all over the state (and in some cases, from out of state). It was a privilege to hear the winemaker talk of wines they were pouring and how they are made. Neither one of us is a fan of Chardonnay and yet bought a bottle to take home (it was that good). And Chris got to drink my Cab Franc. Lucky guy, that I don’t drink red. It’s not just the water. It’s not just the sky. It’s not just the peace. It’s not just the wine. It’s not just the good company. It’s not just a greasy breakfast before heading out to taste wine. It’s not just feeling sand in my toes. It’s not just the lighthouses. It’s not just driving with the windows down and feeling the breeze from the water. It’s all of that. Every bit of it. And somehow Traverse City feels like the kinda place that could feel like home. Cheers, Traverse City. Thank you for another lovely weekend. In honor of TIL Tuesday which has been kinda MIA for awhile… in no particular order (and man, I hope I counted correctly), 50 things that make me happy. I haven’t done a TIL Tuesday (Things I Love Tuesday) post in awhile – and that’s a shame because it’s probably way more fun than reading about all of the things that are currently freaking me out or me griping about the weather. I’ve gotten some fun stuff in my mailbox lately so let me tell you a few things that I’ve gotten that I adore. This came in January’s Birchbox. Birchbox remains one of my random splurges these days – my house may be freezing but I’ll spend ten bucks a month to get a box of fun things in the mail. The Keratase is an awesome heat protecting styling product that does some awesome mojo when I straighten my hair (it makes no discernible difference when heat styling products aren’t used – at least for me). 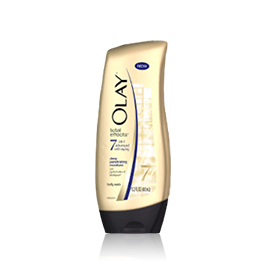 But I’ve used this twice now when straightening my hair and the end result is softer and shinier hair with less frizz. It also makes the ends look healthier. So full of win. Actually, I love Birchbox in general. While I don’t love every product (perfume samples? Mehhhhhh…), I do love the fun of opening each month and trying things I wouldn’t try otherwise. I’ve found some amazing things that someday I’ll actually purchase. Probably. I remember seeing the blog – the mom who made these amazing scenes every afternoon while her baby girl was napping. I know neither of my daughters would have ever slept through that, but the blog was lovely and now the images have been made into a book. I received a review copy today. My daughters love it, the photographs are lovely and I think it will make an excellent baby shower gift. I know this may seem ridiculous but I am kinda glad to see they have Fancy Nancy growing up a little for her readers that are getting better at reading. It was one of my favorite series for Pumpkin and I was bummed to see her outgrow the series. Now we can hang on to this fun series a little longer. I am tired. After spending over a week out of state and a week trying to unbury myself from the hole that being gone for eleven days puts you in, I am trying to figure out what’s what, who’s who, and OH MY GOSH WHY IS SUMMER THREE HUNDRED YEARS LONG? I returned from California to a few great packages of Avon stuff on my front porch for me to try out and tell y’all about. In case you didn’t catch it on Twitter, I’m one of the Brand Ambassadors for Avon – which I kind of love because given my involvement with the Avon Walk for Breast Cancer? I’m already kind of in love with the company. So, here I am, home from California with some great stuff to try out (including a concealer that made my gruesome nose sunburn look a little less Rudolph the RedNose Reindeer and a little more…human). Fact of the matter is that generally in the summer, my already minimal makeup routine gets knocked down a few pegs and is even more grounded on simplicity than ever. Why? Well, I’m spending my days refereeing two kids – and when the temperatures ratchet their way up into the 80s and 90s, I just want to sit in the AC and try to avoid melting! But… I don’t like to have a completely blank palette. I may skip everything else in a makeup routine (and summer months call for tinted moisturizer, mascara and sometimes a light swoop of brown eyeliner), but I want it to look intentional, not lazy. So, I’m kinda digging the Avon SuperSHOCK liquid lipshine (They sent me Red Radiance and Melon Madness to try out). Both colors I received look VERY BRIGHT in the tube – almost scarily so – but applied? They are very wearable. In the pic above I have on Red Radiance. I love it – AND I NEVER WEAR RED. This gloss doesn’t feel too sticky (your hair WILL stick in it if the wind blows, though. Sorry), doesn’t have an overly fruity taste or an overly chemical taste (Oh, come on – you know you taste your lip gloss too), and with SPF 15, your beautiful and shiny lips get some protection from the big mean sun (your justification for wearing lip gloss at the beach). As an Avon ambassador, I was sent product for review and will be compensated for this post, the opinions expressed within are my own, as always. There are a great many things that I love – I love cappuccinos from Starbucks and cheap funky $2 knee socks from Target – but one of the things I love most is an organization I learned about recently, and it’s already won a place in my heart. It may just be there forever. 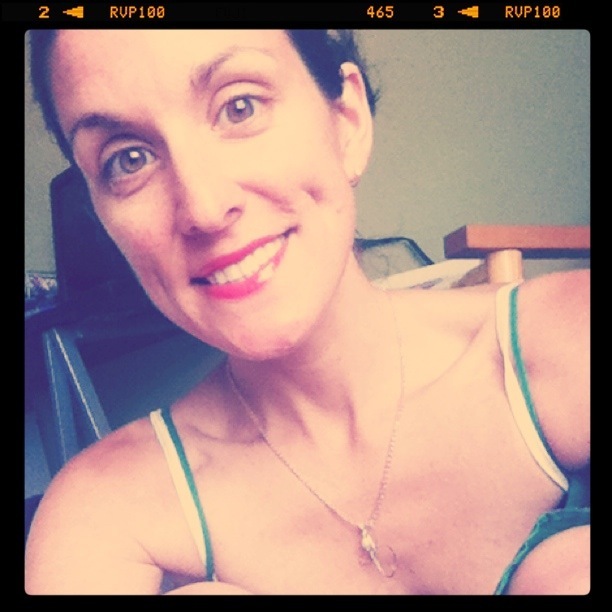 This month, the Love Drop team has chosen to help Katie. Selfishly, I am overjoyed – because Katie is a friend of mine. Katie would never ask for help. Her heart is tremendously huge and she is one of those people who enriches my life and my world – just by knowing her. Katie keeps me positive when I sometimes feel less than positive. And Katie keeps herself positive, even though things aren’t always easy. Here, I’ll let her tell you her story. This month, the awesomeness that is Love Drop is reaching out to help Katie, and helping to put a dent in her medical bills. Next month, they’ll work their loving mojo to help someone else. I’m in awe of Nate and J Money, the guys behind Love Drop, and amazed at the power of what people can accomplish when they come together to do GOOD. These guys have a fan for life. I love them, I love Katie. If you have yet to check out LOVE DROP, please check it out today. I first saw Amy Krouse Rosenthal’s video on YouTube a few years ago – and immediately fell in love with the simplicity and the optimism and joy and amazement of this project. If you haven’t seen it, you should watch the video above. The next steps are that Amy and a hand-picked panel of awesome people picked a lot of Lovely things – art, music, and other lovely endeavors – to put together in a movie. Now, they’re seeking help from lovely people to help get this lovely movie made. Amy is hoping to raise $11,111 to make this movie so that it can be made and released on 11/11/11. I’d love to see her project come to fruition. Be sure to click over to the Kickstarter page to pledge and help make it happen. Last week, the folks at Procter & Gamble gave me the opportunity to talk to Rebekah George, a guru of skincare and prettyness, about how to care for your skin during the winter. She had a lot of tips – and one of them was to not necessarily moisturize more, but moisturize better. And then I got this box in the mail. And in this box was one of the products that Rebekah recommended: 7-in-1 Advanced Anti-Aging Deep Penetrating Moisture Body Wash (Say that three times fast). And then I told my inner selves to shut up and go run a bath. Most importantly (to me, anyway) – it smells very good. I have priorities – and while this is indeed scented, it’s not overwhelming or gross. Secondly, this stuff is thick, but rinses clean and doesn’t leave you yucky and filmy after you get out of the shower. And? Happily, it IS moisturizing. Which is good, because… well, it SAYS it is. Always nice when a product does what it’s supposed to do. As for the anti-aging part – I don’t know if I look or feel any younger, or if my body looks or feels any younger, but I’m just happy to get clean and moisturized, really. Oh, and I smell amazing. The body wash was sent to me at no charge to me, but the opinions and the obsession about my age are purely my own. I know, I know… It’s Wednesday not Tuesday – but you’ll forgive me. Someday. I hope. If you aren’t grudge holders. You’re not grudge-holders, are you? Anyway, the past few weeks have been a little chaotic around here, but I wanted to take a few minutes to share with you a product that I REALLY dig, that I have been truly grateful for. It is something I purchased on my own, for myself, outta my own pocket. No one is paying me to say nice things about it – which is why I’m using an affiliate link – because you’ll want one, and I’ll take the Amazon kickbacks… yeah. Six cents at a time, baby. I’m talking about the OK to Wake! 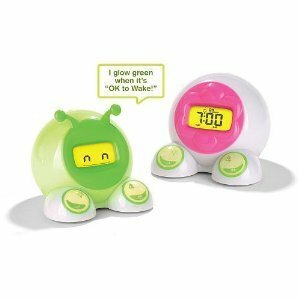 Children’s Alarm Clock and Nightlight . When I saw the price tag (just under thirty smackeroos), I hesitated. And then I remembered just how much I love sleep and just how much I loathe being woken up before six a.m.
You see, Pumpkin is a morning person. From the day she was born, making her grand debut at 5:53 a.m., there have been VERY few days where she’s slept past 6. She’s five now, so you can imagine JUST HOW TIRED I AM. To me, it’s a psychological thing. If you wake me at 6:01, I’m fine. 5:59? All day long I’ll groan about how I was up before six. What this clock does is allow parents to set a time at which it’s okay for the child to wake them up. When that time comes, the clock glows. The kid knows it’s okay to wake up mom and dad, and if she’s anything like MINE, she’s in there right on the nose. Since getting this clock a week ago, I have gotten to sleep until at least 6 every day. I EVEN GOT MY EXTRA HOUR OF SLEEP ON SUNDAY. Oh yes. So the way I see it, the clock has already paid for itself. Plus, it’s kind of cute and she feels like a big kid with her very own clock. I learned how to do laundry in a trial by fire manner. I learned by desperation in the laundry room of my dorm at the beginning of my freshman year of college. Because my mom loves doing laundry – really – I’d never done laundry before. Admittedly some of the habits I created that year stuck with me for a long time (like… uh… 16 years). For starters, remember, dorm washing machines cost money per load. This is where I developed my patented “Shove as much laundry as you can in the machine” method (trademark pending). Unfortunately, I hung on to this method because the fewer loads of laundry you do – the sooner you’re done, right? Well, apparently the downside to this method is… well…. your clothes don’t get clean. There’s no room for the washing machine to do the hokey pokey and turn itself about. And without the agitation of the washing machine and the ability for the water to move around – your stuff just isn’t gonna get as clean. At least I know that NOW. I learned a lot in my two days in Cincinnati this summer at Proctor & Gamble’s Fabric Care University. Not only did I learn that my love for Tim Gunn is TOTALLY justified, I learned a ton about the actual process of washing clothes. 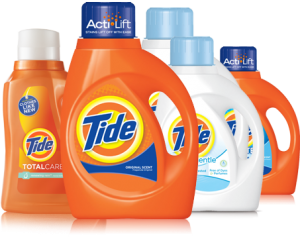 And, I’ve been lucky to have had the opportunity to try some new products from P&G – which, I happen to love. Like a fool, when I was in Cincinnati, I told them, “I have daughters. I don’t worry about stain removal. I just want my clothes to smell pretty.” In fact, I had been using Gain for years – solely for the smell factor (it smells SO good). When the folks at P&G showed us how Acti-Lift worked, I was amazed — but thought for sure that there was no way my dainty lil daughters would ever require such a detergent. Uh. Yeah. Well, summer is peak ice cream eating season (my oldest likes those vanilla soft serve cones with the dark chocolate shell coating). Drip drip. And then there was the dye from another piece of clothing that rubbed onto my daughter’s favorite shirt. And I had a pair of JCrew pants that I spilled something on over a year ago that have been sitting in my laundry room for all this time – as if I was waiting for osmosis to make them wearable again. Am I even that size anymore? Who knew. ActiLift got the ice cream out. No more chocolate. It got the dye off my kid’s shirt. Spectacular. And it even picked up enough of the stain from my khakis that if I hold my breath and move really slowly, I can still squeeze into them again. Oh, and the stain is barely visible (it’s still kind of there – but not as prominently as it was). Stain removal isn’t something I require ALL the time – but when we do need it, it’s nice to have it. 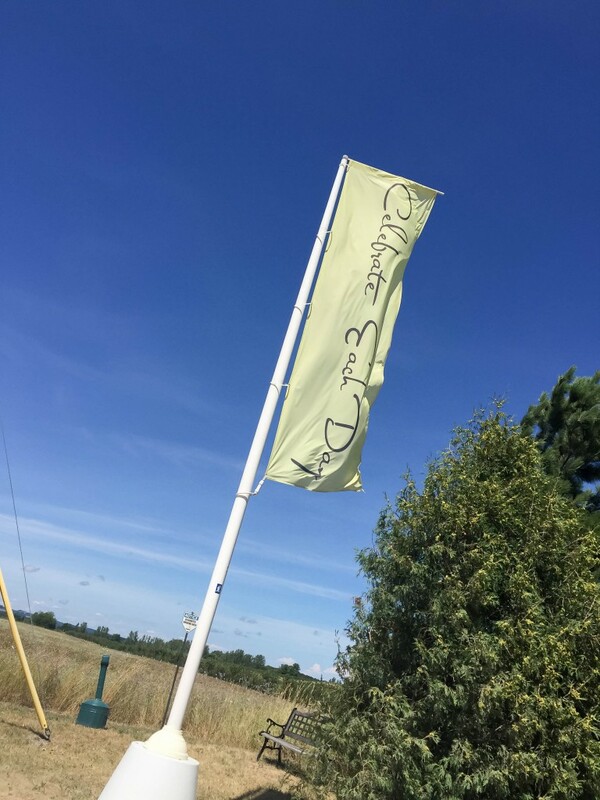 I’ve been digging Coldwater Tide – trying to save some bucks on the electric bill. And yeah, it smells pretty good. Except Mountain Spring. I avoid the Mountain Spring scent like the plague. It’s just not…pleasing to my senses. 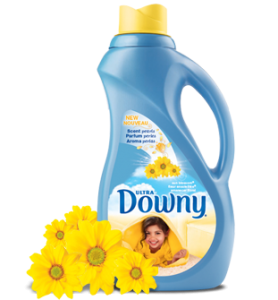 The second product I had the opportunity to try was the new Downy. I already used Downy so it wasn’t a hard conversion (April Fresh has always been my go-to). However, so many people at FCU were raving about the Bounce Bar that I ditched liquid detergent in order to try it. I am kind of a little bit in love with the Bounce Bar and how it lets me add an element of lazy to the laundry process. 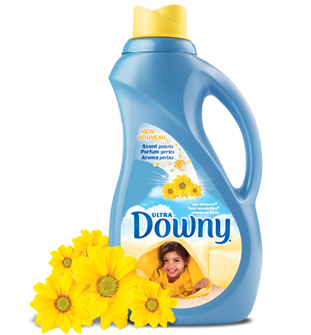 But I wanted to try the new Downy because it promises “Clean Sheet Week”. The ONLY thing I like about doing laundry is the fresh sheet feeling (well, that and finding jewelry – but there’s been no new gems in my washer for awhile). To extend that feeling for more than the first day? Worth a shot, right? The first night of use, I was hyper-aware of what the sheets felt like. I was trying to be observant so that when I came to tell y’all about it, I would have a very thorough review. Same with the second night – still felt great. Third night – fabulous. After the third night, I forgot to pay attention. I’m sorry, life got in the way. (Would you still love me if I took notes for all seven nights – I suspect that would be a little too Becky Home-ecky for some of you. And it would probably scare me a little also). So, yes, there’s an extended sense of “clean sheet feeling” – does it last seven days? I’m not sure. But it definitely lasted three. Which is still pretty good. And I’m a fragrance girl, so if I didn’t mention how much I LOVE the new scent, well… I’d be remiss. Do I love doing laundry? Um. No. Hate it. 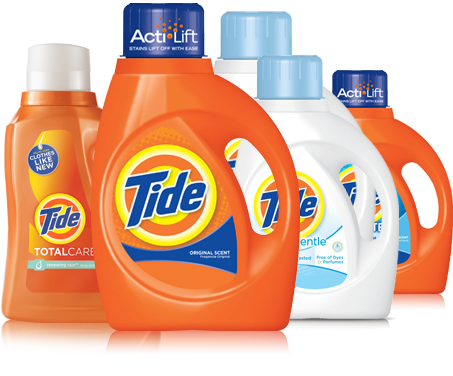 But I do love the Tide and Downy family of products and they work well enough that my ineptitude isn’t obvious. Thank goodness. The products were provided to me free of charge but the opinions are my own, as always. And if anyone would like to come do my laundry and be my laundry slave, I’d be happy to hire you and pay you in cookies.